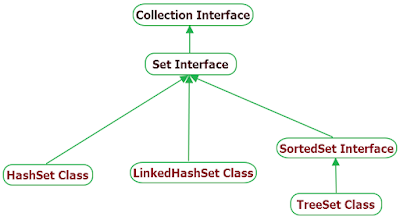 Set is one of the collection framework interface which extends root Collections interface. Set collection can not contain duplicate elements. Set interface has all methods which are inherited from Collection interface with special restriction of not allowing duplicate elements. If two Set interface contains same elements then both are equal. 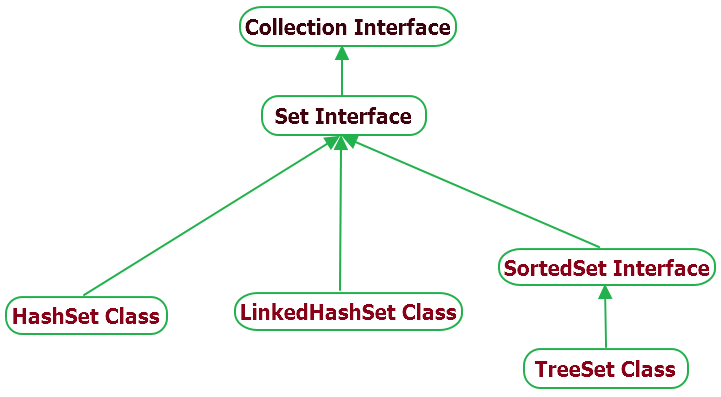 Set interface is implemented by LinkedHashSet, HashSet classes and extended by SortedSet interface which is implemented by TreeSet. boolean add(E e) : It will insert specified element in set if it is not available in set. boolean addAll(Collection<? extends E> c) : It will add all elements of specified collection in set if not already present in set. boolean contains(Object o) : It will return true if given element is available in set. boolean containsAll(Collection<?> c) : It will return true if all the elements of given collection are available in set. boolean equals(Object o) :It will compare specified object with set to check equality. boolean isEmpty() : It will return true if set is empty. int hashCode() :It will returns hash code value for this set. Iterator<E> iterator() : It will return an iterator over the elements in set. boolean remove(Object o) : It will remove specified element from the set if it is present. boolean removeAll(Collection<?> c) : It will remove all those elements from set which are specified in collection. int size() : It will return size of Set. Below given Set interface example will show you demo of Set interface's few important methods. // Check initial size of set. // Add items in set. Try to add duplicate item in set as set can not accept duplicate items. // Print set. It will show only 4 items as set can not hold duplicate items. // Check if set is empty. It will return false. // access set items through Iterator. // Remove item from set. // Set items after removing Item3 from set. This way, You can use java set to store non duplicate items.